Did someone say, “W-A-L-K”? Whether you’re exploring a new trail or hitting your tried-and-true neighborhood loop, taking regular walks with your dog can have many positive effects on her health—and yours. According to the Association for Pet Obesity Prevention (APOP), an estimated 56% of dogs in the U.S. are overweight or obese—and if yours is one of them, she’s also at risk for a number of other health problems, including arthritis, skin infections, heart disease, and diabetes. In addition to proper nutrition, regular walks can help you and your dog maintain a healthy weight, lower your risk of secondary diseases, and increase your lifespan. Not sure where to start? Ask your veterinarian how much exercise your dog needs, as this can vary greatly depending on her age, breed, and health status. Does your dog have a bad habit of chewing the couch or digging up your backyard? Chances are, she’s getting rid of pent-up energy that isn’t being released through physical activity. In addition to its positive effects on physical health, daily exercise also helps regulate boredom, which is often the culprit of many unwanted canine behaviors, including inappropriate elimination, anxiety, aggression, barking, and attention-seeking. Remember, a tired dog is a good dog! Embarking on a walk together gives your dog a chance to socialize in a safe, positive environment—and allows you to meet new people, too. When it comes to learning how to interact with others, practice makes perfect. Give your dog plenty of opportunities to hone her social skills by introducing her to new humans and dogs as often as possible—on a leash, of course, so you can quickly correct any problems. A walk is also the perfect time to work on training. Even if your dog has mastered commands like “come” and “leave it” at home, she may find the sights, smells, and sounds of a new environment more interesting than listening to you. 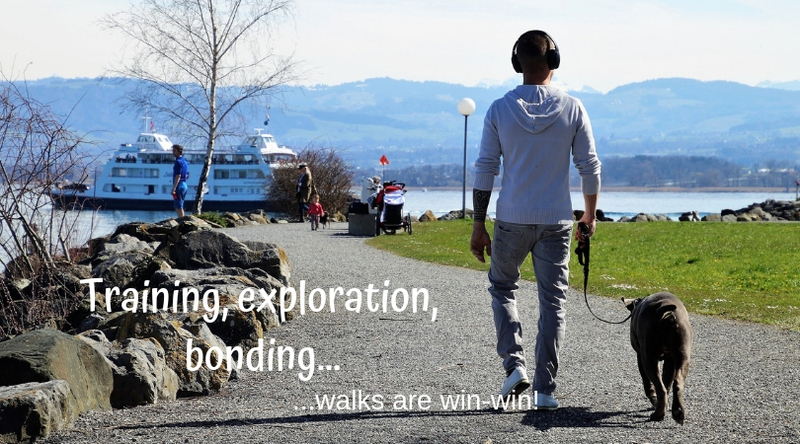 Walks allow you to regularly test and build her skills amid many tempting distractions. Want to make your walk even more enriching? Stop and smell the flowers. While you may find your dog’s habit of pausing to sniff every tree, lamppost, or stranger along your route annoying, it’s important to remember that to her, it’s an exciting time to explore the world beyond your home. Sniffing is an important part of your dog’s mental stimulation, so don’t rush it—slow down, take a deep breath, and enjoy the experience together. Finally, spending regular, quality one-on-one time together will help you and your dog strengthen and deepen your bond. What could be more rewarding than that? Want to learn more about keeping your dog healthy? Contact us or schedule an appointment today!